The winner of Nigeria's presidential election, Muhammadu Buhari, says his victory proves that the country has embraced democracy. The former military ruler, who leads the All Progressives Congress (APC) beat outgoing President Goodluck Jonathan of the People's Democratic Party (PDP) by 15.4 million votes to 12.9 million. Here Nigerians discuss the election and how they see the future of their country. The result might not be fair to all, but to me this is the fairest of all elections of our time where everyone is allowed to participate. The results collated from each polling station and presented at the Inec [election commission] office are to me 100% authentic. Provided, of course, that each party agent representing their parties was on the ground, witnessed the counting of the results and signed off the schedule paper. There is no better way to describe this election but to to say thank you to every Nigerian and most of all the number one citizen of the country - President Goodluck Ebele Jonathan for accepting the defeat in good faith and even calling General Muhammadu Buhari to congratulate him. I wasn't surprised at the result because the turnout was so great. With this result, freedom will come back to Nigeria. We the people are the ones who voted in this president. We voted him in to do something. I am excited for the future of Nigeria. The country has been in chaos. We have been dying in silence and no-one was saying anything. Change will come with this government. There will be more employment opportunities and better education and the youth will come back to Nigeria. Nigerians are happier. For the first time we have seen a leader who listens to and respects the choice of the people. Indeed, the sitting president's exemplary act of peace is the icing to the cake for Nigeria's democracy. Rather than weep and call out to his supporters to make the government ungovernable, thus inciting religious tension and initiating sectarian conflict such as that by Boko Haram, he accepted defeat so that Nigeria's fragile democracy can mature. A true example of statesmanship. I salute the President of the Federal Republic of Nigeria. Andy Bello, Benin City, Nigeria emails: The election reflects the choice of the majority despite massive rigging and irregularities on the part of the ruling party in the south south. So, Buhari needs to now focus on uniting the nation and recruiting technocrats who can help rebuild the crippling economy and strive hard to redeem that part of his image that his antecedent as a military dictator dented. Maryam Yakub Yareema, Kano, Nigeria emails: God has answered our prayers. The election was conducted in Nigeria in a safe and ordinary manner and the outcome was very amazing. 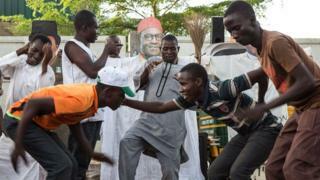 Almost all Nigerians were glad, happy and full of joy and contentment. Change has come to us but we Nigerians must change our habits before Baba Buhari brings change to our nation. Ez Dikio, Nigeria emails: Nigeria is in for the worst. The vote was on religious lines. In the north of Nigeria, biometric readers were not used. The election was rigged. The PDP cabal who destroyed PDP moved to APC. The man has nothing to offer Nigeria. Everyone will see this soon afterwards.